I just wanted to wish our customers, staff, and friends happy holidays and a prosperous new year. 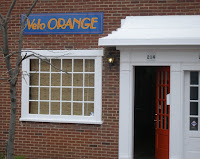 Thanks for making 2010 a spectacular year at Velo Orange. 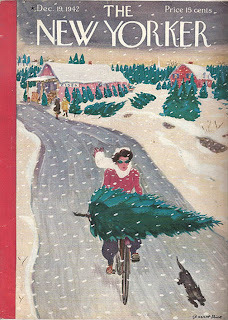 Velo Orange will be closed from December 24th through January 2nd for our annual holiday break. If you need anything shipped this week, please order before 12pm on December 23rd. Our holiday shipping deal will end on January 2nd. 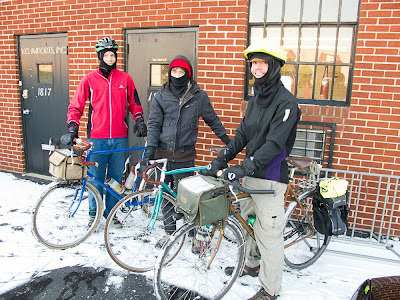 I want to congratulate the three members of the VO staff who continue to commute by bike even when it snows. They are Robert, Collin, and Alec. I have to admit that I never liked riding in snow, especially after a painful crash on a patch of ice years ago. So I have nothing but admiration for this hardy bunch. BTW, Robert gets double kudos because he won his first cyclo-cross race last weekend. And Alec does ride in those sandals. Anyone else bike commute all winter in snow country? Have any tips to share? Also, there are a few new items on our specials page. You may remember that, a few weeks ago, I started a series a posts about VO's history. This is the second post; part one can be found here. Before long we'd outgrown our first garage-sized space and found a storefront on West Street in Annapolis, which is essentially main street. The space was cheap because the building's owner planned to tear it down and redevelop (three years later, it's still for lease and still not razed). We signed renewable 90-day lease and I spent a week repainting and buying furniture. (A few more photos of the new space can be found here.) Since this was in the midst of a major commercial real estate slump, I guessed that it would be many years before the building was replaced and I was overjoyed at the dirt-cheap rent. What I didn't plan on was VO's outgrowing the space in 10 months and having to take more space next door. Then, 8 months later, we outgrew the combined space. Now that we had a retail showroom, we opened accounts with several domestic distributors. This allowed us to offer many products that we could not import directly. We soon had two more employees - Heidi, who ran the shipping and packing end of it, and Tom who sourced products and also started to develop a wholesale company. Tom had loads of experience in the bike industry and in sourcing parts overseas. He knew which factories had the best quality, knew many of the owners, and had a relationship with a superb trading company in Taiwan. Now I could concentrate on envisioning and designing things, and Tom would take care of having them made. We also decided to offer semi-custom frames and found two excellent builders to make them. The rando frame was a huge success and we soon had a two-to-three year waiting list. Unfortunately, our rando frame builder promptly declared bankruptcy and left us to refund many thousands of dollars of frame deposits he'd held. The city bike frames did not sell as well. I eventually decided that custom, even semi-custom, frames were simply not worth the trouble. The frames were perpetually late, customers wanted to change specs at the last minute, and I was spending far too much time on each order. Despite all this, the frames were generally brilliant; they were beautiful, rode like a dream, and those who got them loved them. I realized that in the amount of time it took to have a few custom frames made, we could design and produce hundreds of production frames that were based on our successful custom designs. 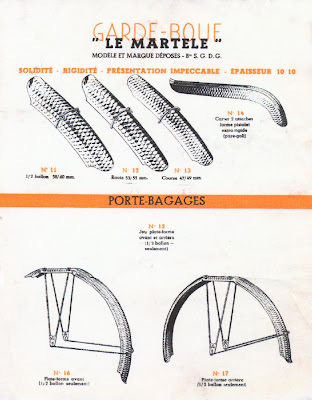 The production frame project had a steep learning curve, but eventually we managed to have three frames produced: the Rando, the Polyvalent, and the Mixte. One of my basic business rules was to try to offer things that were unavailable, or at least difficult to find, elsewhere. We were still selling a lot of new-old-stock items, but our suppliers were running out of the good stuff. And our growth meant that we had to look for stashes of hundreds, not dozens, of NOS parts. When we started going to Asia to visit factories I was surprised to learned that we were getting big enough to have many more of our own components manufactured. The focus of the company changed almost overnight; we went from looking for NOS stuff and being reluctant manufacturers to focusing on designing VO products. 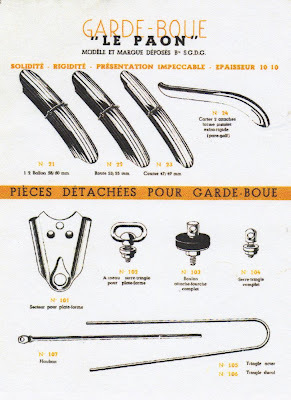 I remember a few factory owners' skeptical looks when asked to make some of our early products. Who would buy roller hangers, or decaleurs, or 650b fenders? What sort of company was this VO? I'm sure our agent had to convince a few factory owners that we knew what we were doing, or could at least pay for our follies. As the new products arrived we heard from more and more shop owners who wanted to stock them. 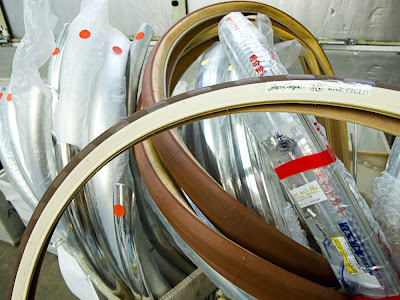 VO Imports, our new sister company, was growing even faster than Velo Orange. Before long we had hundreds of dealers all over the world. Interestingly, we often sell VO racks and bars made in Japan to Japanese shops and VO components made in Taiwan to customers in Taipei. In July 2008 we moved again, to two warehouses in the industrial section of Annapolis. Our new space was a few doors down from my former company, Chesapeake Light Craft. We also hired several more employees and suddenly had a staff of 11. I'll write about the last couple of years in the next installment. We now have the new Grand Cru Titanium saddles in stock.They have titanium frames and titanium rails, obviously. 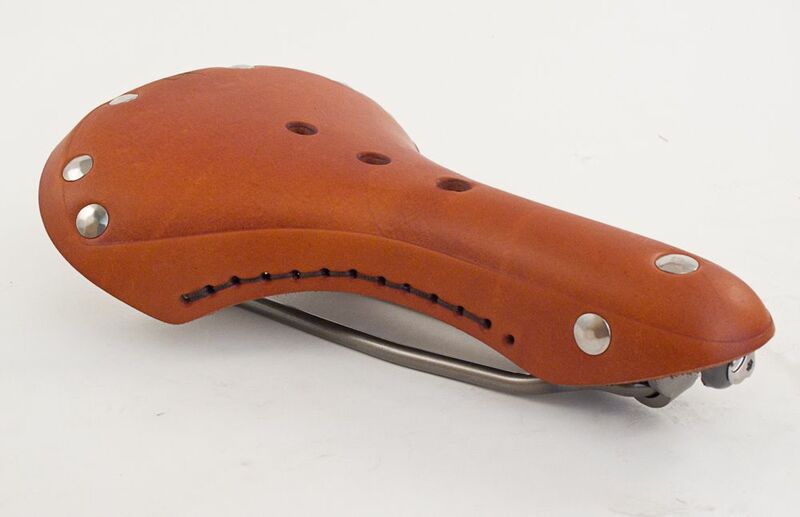 The shape of the top is like our very popular VO Model #3 saddle, but with a cutaway skirt to save weight. What remains of the skirt skirt is laced to prevent flaring as the saddle ages. The leather is extra thick and there's an anti-stretch layer laminated onto the bottom to further increase longevity. Weight is about 420g, length is 285mm, and width is 170mm. This is a particularly good saddle for those who like their handlebars at or above saddle height. The rails are extra long and it does have bag loops. It's available in black, brown, and honey. We're still working on the carbon fiber rivets. I've been using racks with integrated decaleurs on two of my own bikes for a couple of years and absolutely love them. 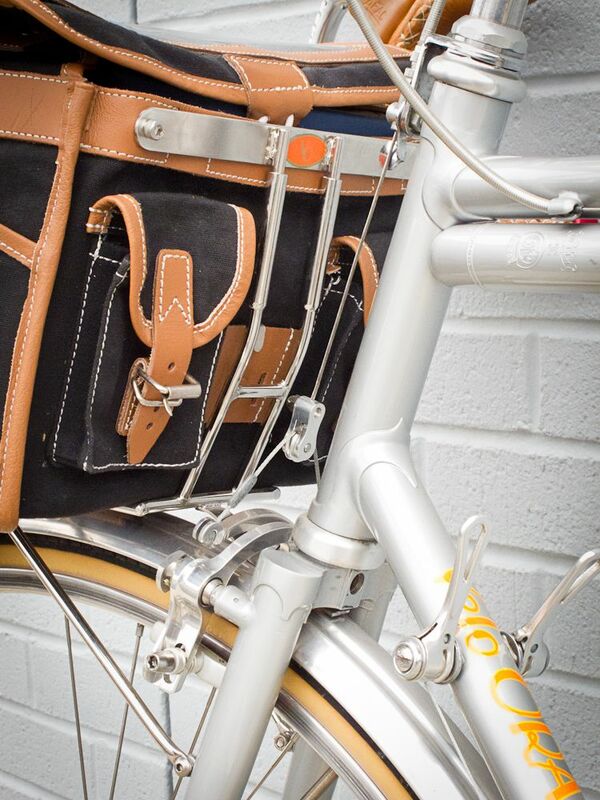 They make a solid and rattle-free system that perfects the whole handlebar bag experience. I have two bags, a VO Campagne bag and a huge Japanese Alps handlebar bag. Each has a decaleur attachment installed so switching bags is as simple as lifting one off and dropping the other in place. I've also used the system with a basket for farmer's market trips. If I don't need to use a bag, I simply slide the U-shaped piece into place and have a regular front rack. Of all the products we've developed, this is among those I'm most proud of. Not only does it clean up and simplify bag mounting, but it's much cleaner, lighter, and simpler to install than a separate decaleur and rack. BTW, I know that they look a little tall in the photos, but once on your bike they blend right in and look great. 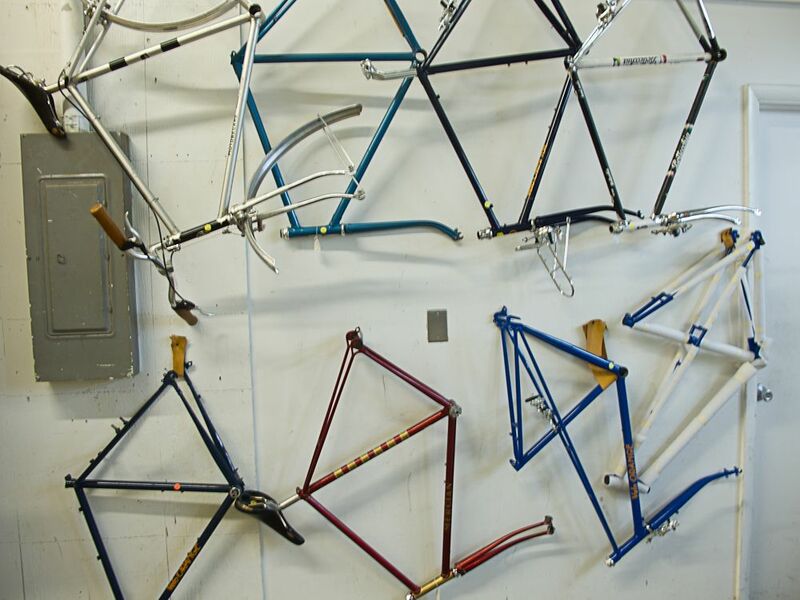 We used to sell racks like these, but our US supplier couldn't keep making them. The new ones are all stainless steel and made in Taiwan. The stainless construction means that they will never rust or flake. They are available in two versions. 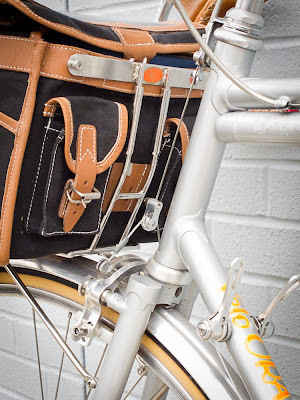 The Pass Hunter rack fits bikes with canti brakes, while the Rando rack is for bikes with caliper brakes. Remember these cranks? They are the chrome plated version of our new compact double crankset that were produced in error. We made a prototype that was chrome plated aluminum alloy. While it looked great and performed perfectly, most folks preferred a polished alloy finish, as on the triple and polyvalent cranks. Unfortunately, the change in specifications did not reach the factory. We received some in August; the rest just arrived. Again, they look and function perfectly in every way and have proven to be very durable. They are simply not what we wanted. So I decided we'd just blow them out. The regular anodized finish version are also available. We also ordered a wrong fender model. Instead of ordering a model we were almost out of, we ordered one that we had tons of. So our 48mm fluted fenders are on sale. Not a good day in the ordering department! Here are a few little projects and developments that may interest you. 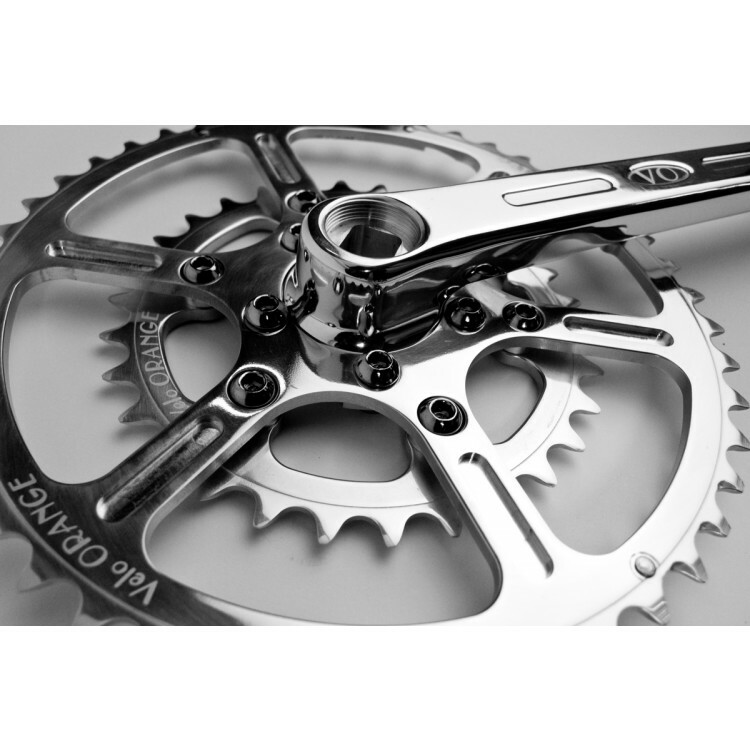 Grand Cru 50.4bcd cranksets are now 10-speed compatible. We had a problem with a few chain rings that were made 0.5mm thicker than specified. This was limited just a small percentage of the first production run. We have replacements that work with 10-speed chains. 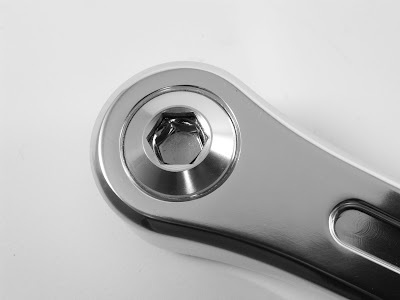 If you've bought one one of these cranks previously and have one of the thicker 2.5mm inner rings, we can supply a replacement 2.0mm ring (measure at the base of the teeth). It only matters if you run a 10-speed chain. Unlike many companies we often make components that factories are unfamiliar with. Every crank factory is expert at 110bcd rings, but our 50.4bcd rings are designed from scratch and so it's easier for an error to creep in. Our new glassine packaging is very cool, if I do say so myself. We've been looking for a distinctive and environmentally-friendly packaging system for small parts. Kyle came up with the idea of glassine envelopes and worked tirelessly to find a source for them in Taiwan. It'll take a year or more until all the small parts come this way, but we're on the way. The package above contains down tube cable stops. 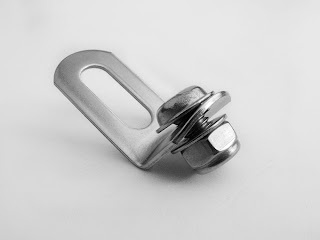 This is our newly designed fender L-bracket. This bracket uses a single 6mm bolt so it fits front fenders designed for a fork crown daruma and uses the existing hole. Darumas work on most bikes, but sometimes there is not enough room in the steerer tube, especially on carbon forks. So if you can't, or choose not to use, a daruma this is an easy substitute. It can also be used on a rear fender, but you need to drill the hole. Works perfectly on VO and Honjo fenders and probably on some others too. We have a new scissor action kickstand. 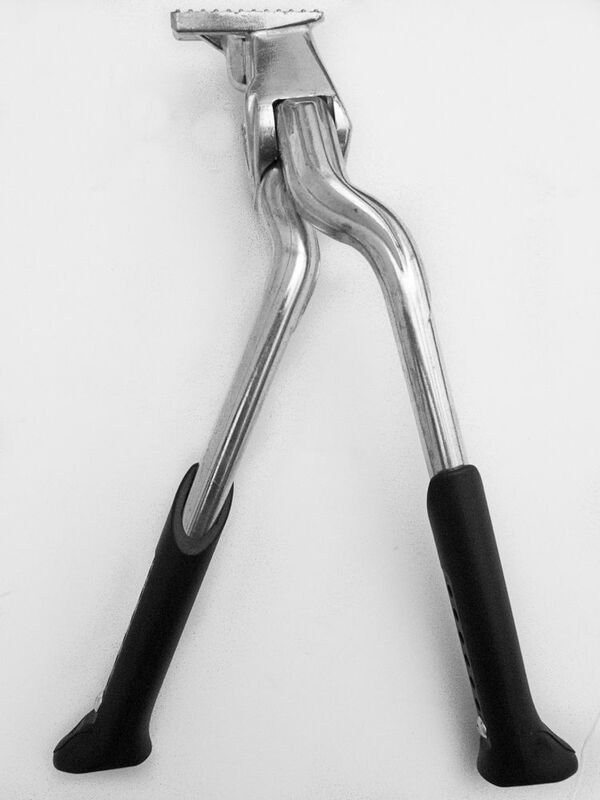 The Copenhagen kickstand is a double leg stand that allows both legs to fold to the non-drive side, much like the Pletscher stand we stock. 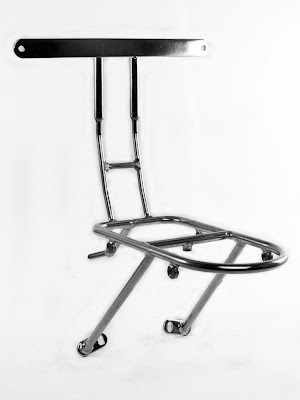 The Copenhagen stand has the advantage of adjustable leg length. And it's less expensive. We have a small quantity of tan mudflaps. If the tan color sells well we'll keep making them. 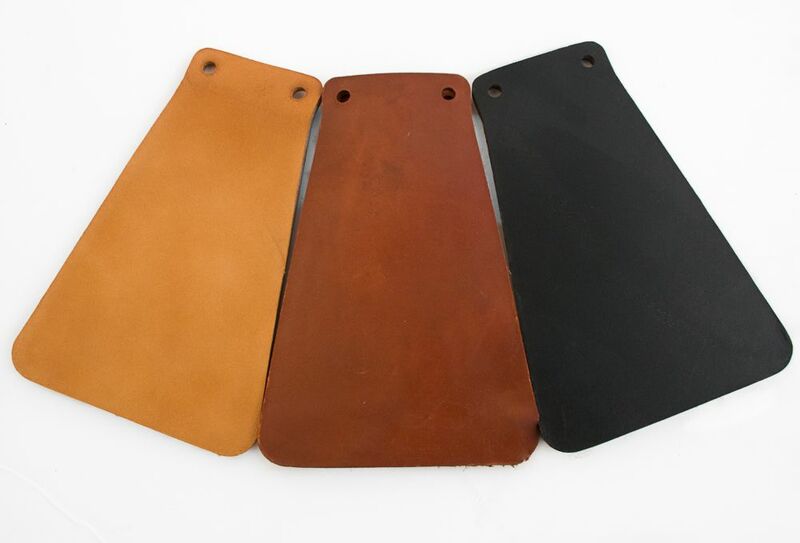 We've had problems keeping leather items in stock recently, not because of unusually strong sales, but because the little Northern California tannery that supplies our leather has seen a shortage of good quality hides. We may have to find out where that Gucci guy get his. As we did last year, we're offering free shipping over the holiday season. From November 25th through January 2nd, we're offering free ground shipping on all orders over $100. This offer does not apply to wheels and frames (because they are over-sized), and it only applies to orders shipped to the continental USA. 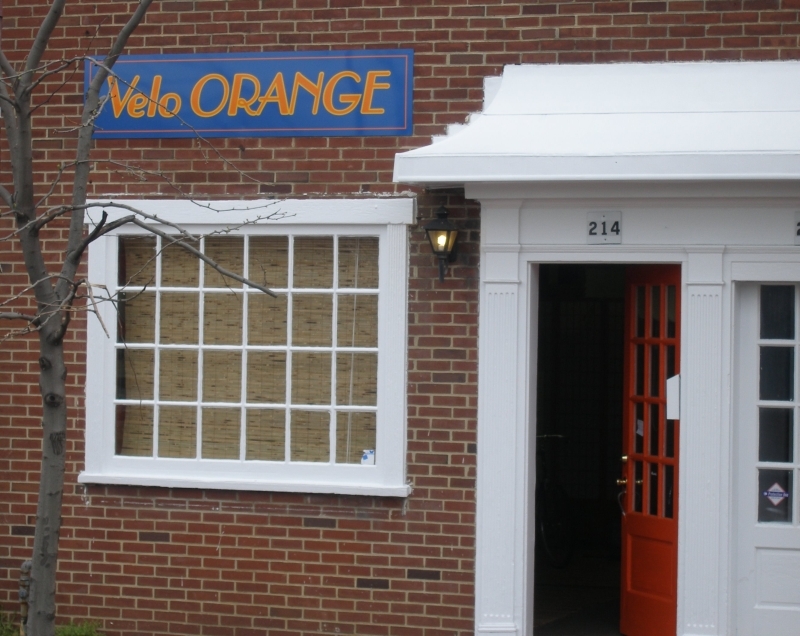 Velo Orange will be closed from 4pm today until 9am Monday for the Thanksgiving holiday. 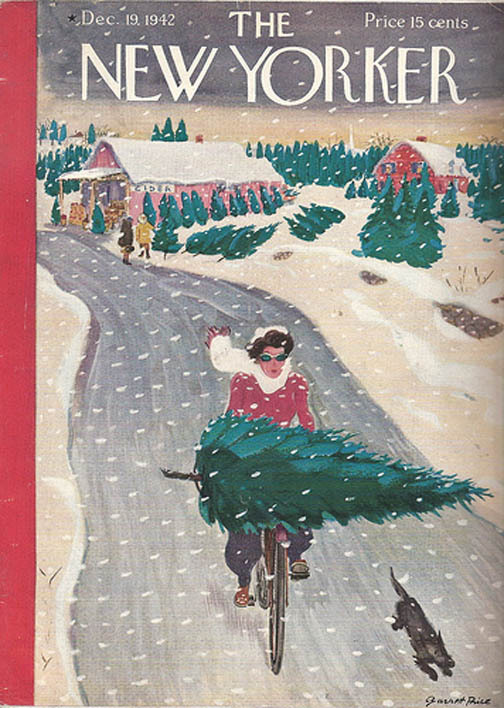 We wish all of you a pleasant holiday and hope you have time to get out on your bikes. If you get bored waiting for the big meal, check out the Velo-porteur-ancien blog. 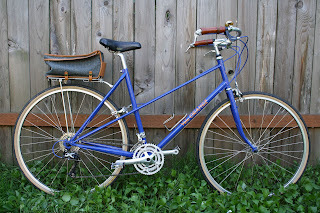 In French, but great photos and lots of examples of how porteur bikes should be set up. 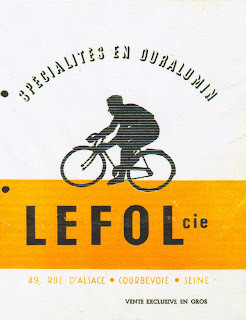 Velogibe is another neat French blog. And you might enjoy collection de vélos anciens Gilbert FAUTRIER and Tonoton Velo. Anyone know of other cool non-English language sites? Please post. Our first coupon code "flash sale" was so successful that we decided to do another. 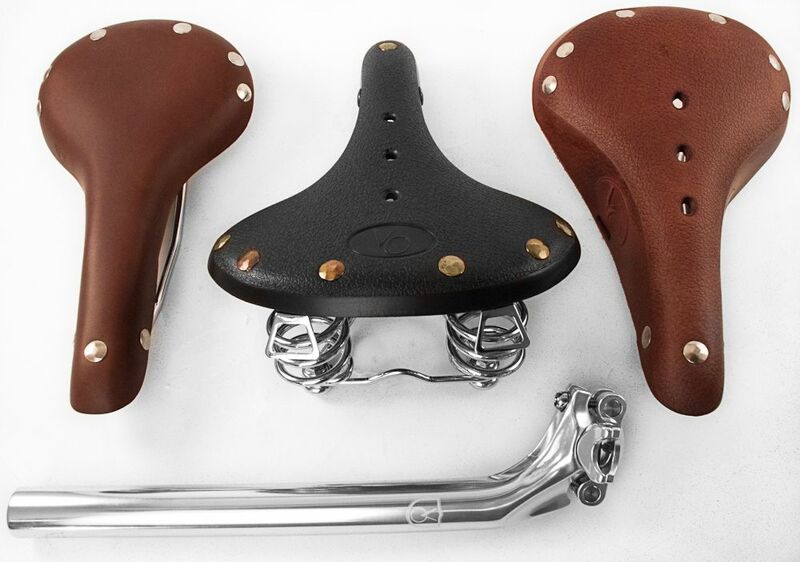 This time VO saddles and the Grand Cru seat post will be 20% off. The sale lasts from 12:00am Saturday, Nov. 20 until 11:59pm Sunday; that's EST time zone. The coupon code is "saddledays". Click on "My Cart" (not "Checkout") on the top right of the screen to enter a coupon or a gift certificate. We also have gift certificates again, just in time for the holidays. 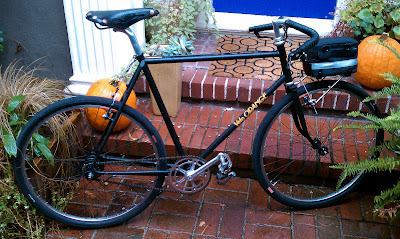 One of our Japanese customers sent us a link to his blog that describes his building-up a VO Rando frame. The build is super as is that flashlight and holder. I love blogs like this. 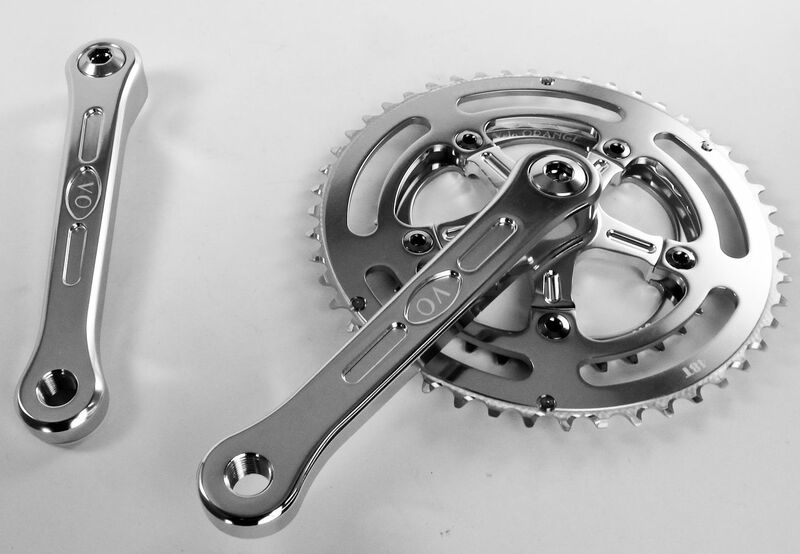 Here's a flicker set about installing a Grand Cru crankset. How about this tandem that's based on am old Gitane frame. I like the linked VO chainguards. In case you missed them, check the comments section in this recent post for more links to pics of cool bikes. Prices for Japanese products continue to rise along with the value of the Yen. If you need Nitto, Honjo, Ostrich, or Sugino products, it might be wise to buy them sooner rather than waiting until Spring. Would that make you a currency speculator? We're occasionally asked if any VO products are made in China. One of our bottle cages is. About 90 percent of our products are made in Taiwan. A few are still manufactured in Japan, the USA, or various other places. 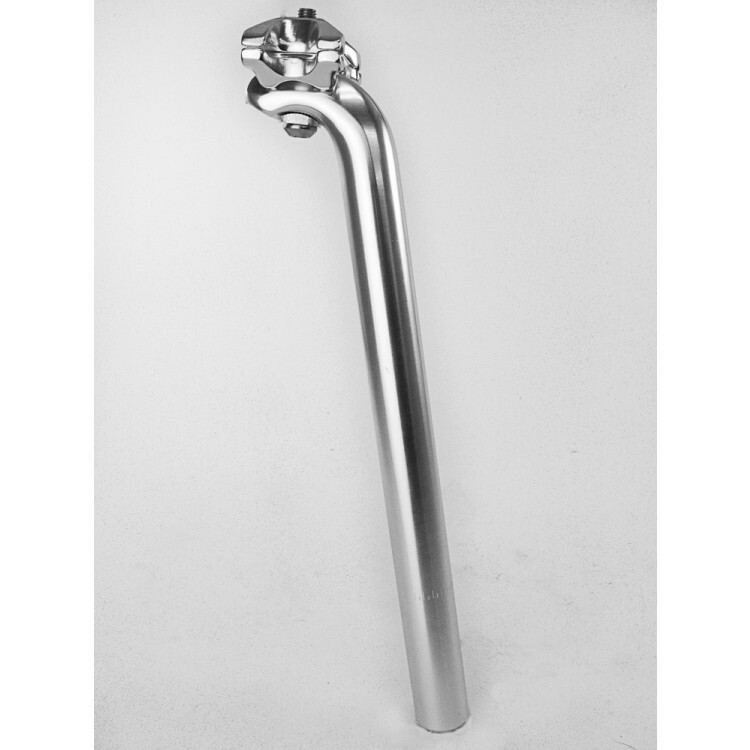 Some of our products are being stocked by Quality Bike Parts, or QBP, the worlds largest bike parts distributor. So over 4000 bike shops now have access to them. The question we get is, "Which of the high-end compact double cranks should I put on my new bike?" 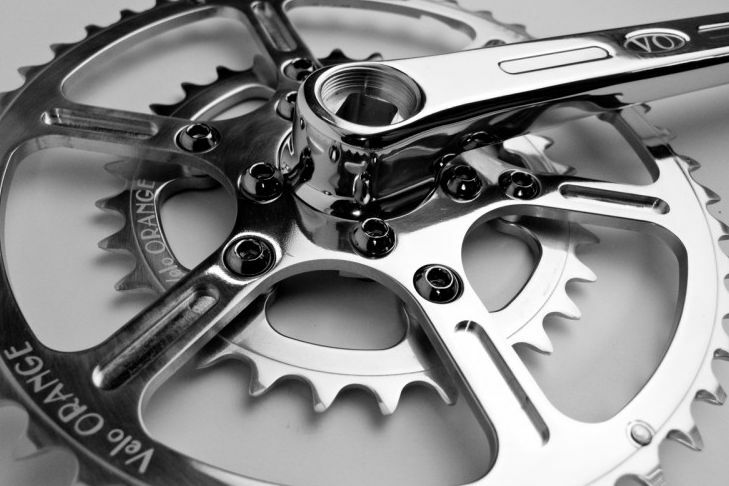 Since we've been long-time fans of the Sugino Alpina crank and now we make what is seen by many as a competing crank, the Grand Cru 110, it's a question we must often address. The Alpina is regarded by many as the best compact double available today, the successor to the discontinued TA Zephyr. How to choose? I'll try to be objective about this and do a point by point comparison. This is the most obvious difference between the two cranks. The Alpina is a modern design while the Grand Cru could have been designed in the 1960s. Since this is strictly a matter of taste neither crank has an advantage. The Crand Cru double has a q-factor of about 140mm; the Alpina's is 159mm. Both use 110mm square taper BBs. So the Grand Cru has significantly lower tread, which some cyclist believe results in less knee pain and a higher power output. A 172.5mm Alpina crankset weighs 702g. 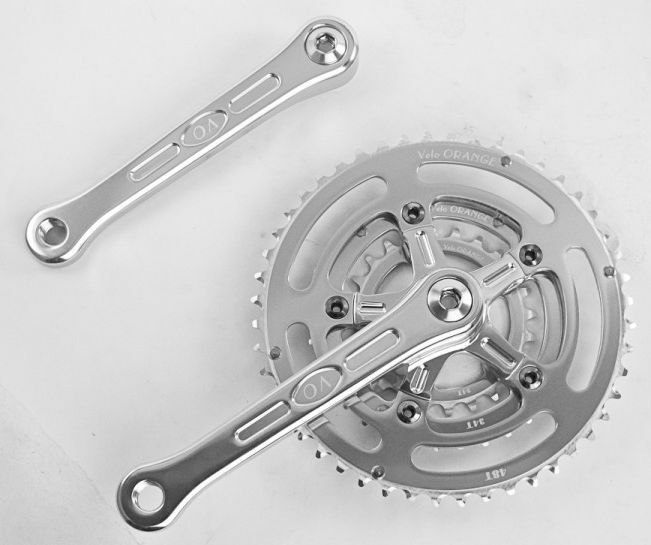 The Grand Cru 172.5mm crankset weighs 683g. 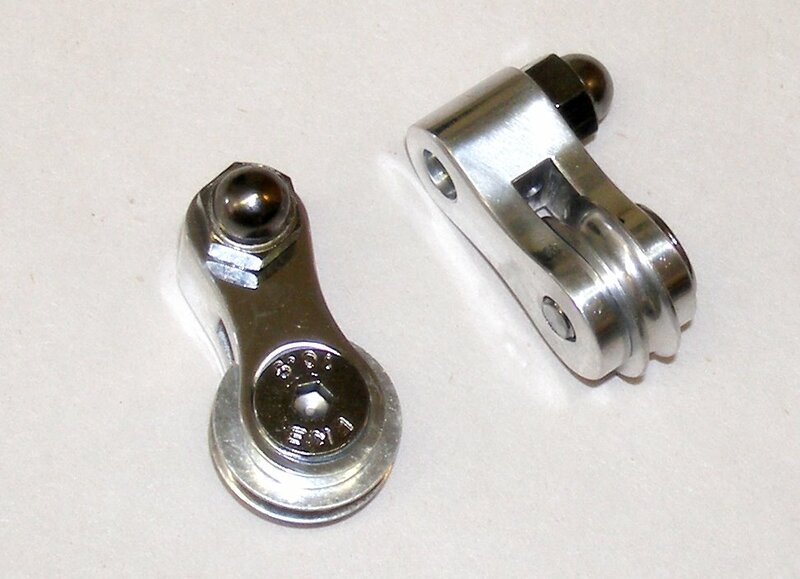 Both cranks have very well made 110bcd CNC cut chain rings made of 7075 alloy. These have superior wear characteristics compared to the chain rings found on lower cost cranks like the Sugino XD and regular VO cranks. Shifting is great with either, perhaps a touch faster with the Grand Cru. Both are 6-10 speed compatible. Note that the Grand Cru is also available as a triple, while the Alpina is only a double. Both cranks have arms that are cold forged and polished. The slightly wider width of the Alpina means that it's probably a little stiffer. Note that each size Grand Cru crank has different crank arm length, while the various sizes of the Alpina cranks all have the same arm length, but with the pedal hole drilled in a different place. Look at the first photo in the post to see what this means. The close up photos below show the differences better that I can explain; click on them to enlarge. The fit is clearly tighter on the Grand Cru cranks. This is most evident where the the chain rings meet the spider. I'd judge the Grand Cru's polish to be a little shinier, while the Alpina has more of a satin finish. The Alpina currently costs $175. The Grand Cru runs $190. So there you have it. The biggest differences are style and Q-factor, but these are very significant for many cyclists. 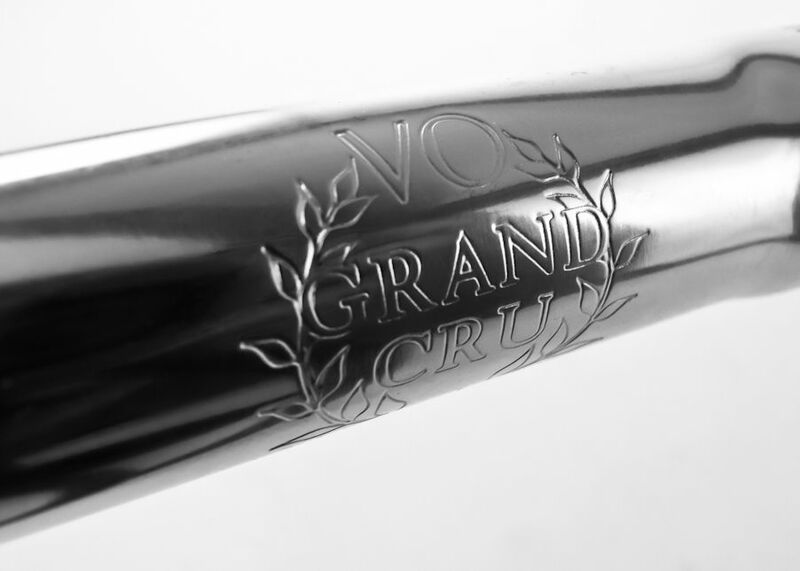 If you need a much lower Q or like the classic style, the Grand Cru is the obvious choice. If Q is unimportant and you like the more modern look, or want to save a few dollars, the Sugino is a very fine alternative. It's hard to go wrong. Do you really need a new frame? Do you really need a new frame? Why not fix up a nice old high-end bike instead? My favorites are upper-tier Motobecanes and Uragos. But there are plenty of other well-made and sweet-riding frames available for next to nothing on E-bay, Craiglist, or the local thrift store. If you're thinking that it's too hard to find those odd sized seat posts, BBs, and headsets, that's no longer an issue. In addition to our French and Italian and British and threadless BBs, and our French and British threaded headsets, we now have seat posts in most of those odd old sizes. 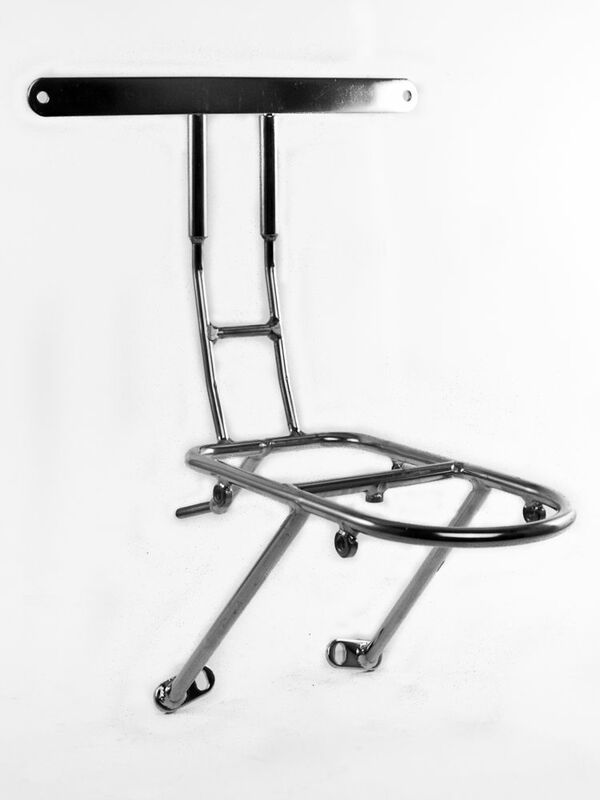 The new posts are the well known UNO seat posts that are basically copies of an old Campagnolo design. It's actually a darn good design that was also used by Nitto, Ritchey, and a dozen other companies. Now there is no question that the $20 UNO post is not as nicely finished as a Grand Cru or Nitto post, but for $20 it's not bad. What is important is that it's available in: 25.0mm, 25.4mm, 26.2mm, 26.4mm, 26.8mm, 27.0mm, and 27.2mm. So the vast majority of old steel frames are covered. 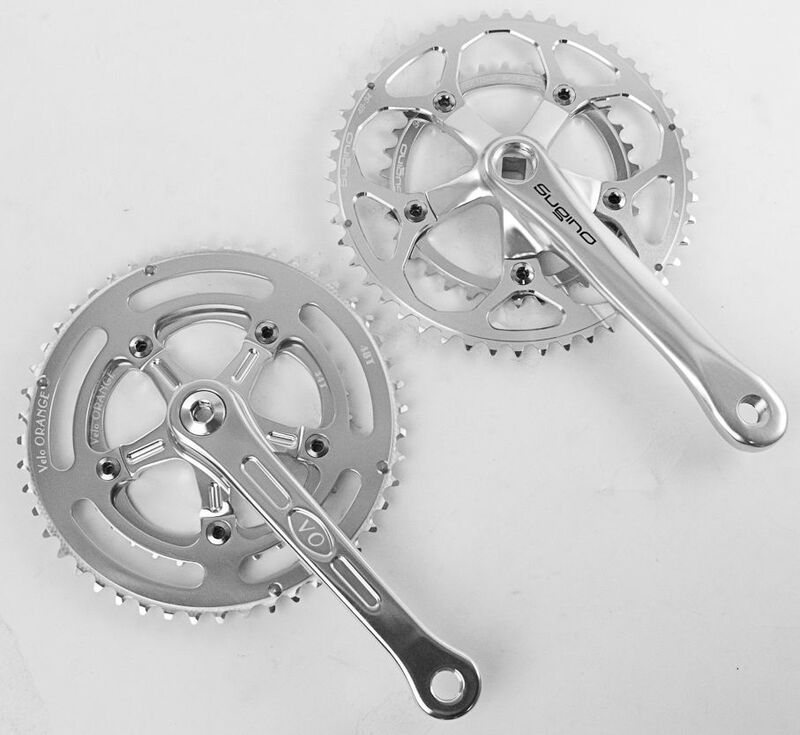 We also have the Grand Cru triple 110bcd cranks in stock, which looks perfect on a classic lugged frame and has durable 7075-alloy chain rings that may outlast the frame. The double version is back in stock too and available in 165mm, 170mm 172.5mm, and in 175mm lengths. 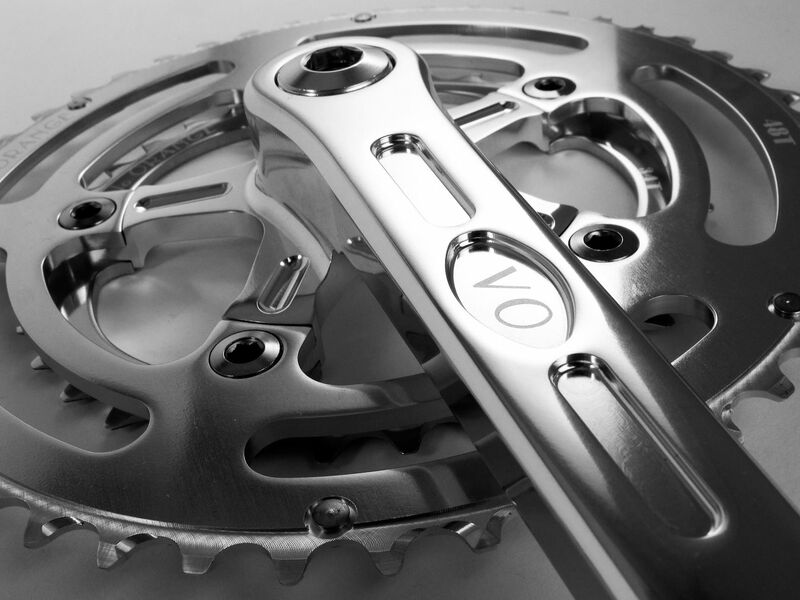 And we'll have the less expensive VO cranks back in stock in a few weeks. Have any pics of cool bikes you've fixed up? Feel free to link in the comments. This is why we need more space. Anyone who was here for the yard sale saw that the middle part of this warehouse bay was almost empty. All these boxes are from one 40-foot container. And there is another 40-footer already at sea and yet another soon to be loaded. Here are some of the items that we were out of and are now back in stock (or will be tomorrow). We also have a bunch of new products that I'll write about in the next few days. Speaking of the yard sale, it was a great success and lots of fun. We met a bunch of very nice customers and saw some old friends. Both the warehouse area and the showroom were packed shoulder-to-shoulder for the first hour and pretty darn busy for the rest of the morning. We sold about 80% of the yard sale items and a lot of you got spectacular deals. Thanks for coming! Here are a few photos of stuff we'll be selling at the VO yard sale this Saturday. We'll have some VO frames that are scratched or are prototypes. 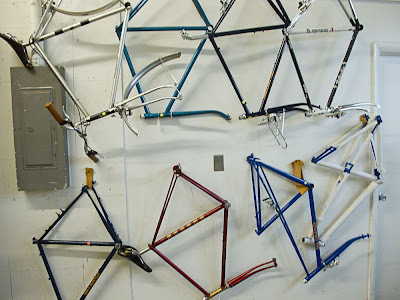 There are also a few classic frames, including a Mercian Superlight, two Motobecanes, a Jack Taylor Tandem, a Bottechia Pro that are owned by staff members or were used for reference. There are a bunch of fenders and a few tires. Many wheels too. Kate, our company barista, will be pulling shots. Finally, we put a few more things on the specials page. We've had a lot going on over the past 8-weeks or so here at VO. We went to InterBike as an exhibitor for the first time, shipped off our biggest order ever to the largest bike distributor in the U.S., got some new employees, lost one of the best (we'll miss you Perry! ), and launched a new website. And had our best ever retail sales week. Needless to say, all of this change makes me want to take stock of things. So, it seemed like a good idea to write a little history–from the conception of VO to where it stands today and where it might be headed. Looking back at where we began 4-1/2 years ago and seeing where we are today is pretty amazing, if not a little scary. I'll write four posts on the subject, beginning with the origins of the company and concluding with where we are today. About 11 years ago Annette and I sold a company I'd founded and decided to take a few years off. We traveled a bit and also enjoyed lot of cycling. Eventually, I went looking for a new bike. Having raced a little in my youth and owned several racing bikes, as well as a couple of touring bikes, I wanted my new bike to be something in between. I knew that my racing days were long over and that we now preferred staying at B&Bs to camping. So this new bike would be for credit card touring and long rides alone in the country, and also for the fast club rides I went on almost every weekend. What I wanted was a rando bike! At first I thought I'd just order a sports touring bike from a well known California company; I rode one and it was nice, but not exactly to my tastes. I'm just not a fan of fancy lugs, two-tone paint, and ornate decals. I also preferred the ride and geometry of several older French bikes I'd owned. 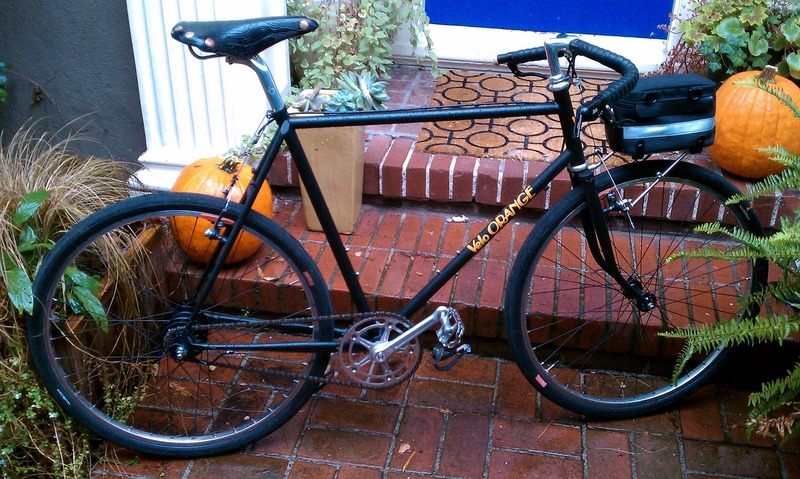 I got a Kogswell Model P as an interim bike. I soon sold it and bought an Ebisu, which I think was, by far, the best production (or semi-production) frame available at the time. It was during this bike search that I realized just how scarce some of the components and accessories that I wanted to use were, and how difficult it was to find a production frame that rode the way I liked. Plus, I was getting the itch to start a new company. So, I decided to form a really small company to source various parts I thought were both cool and useful. I never intended to make much money from it or to grow it beyond one or two employees. It was just something to keep me off the streets, to have a little fun with and, most importantly, to provide a service to other cyclists who shared my tastes. I formed an LLC and deposited the hefty sum of $6000 into its bank account. That was 4-1/2 years ago. 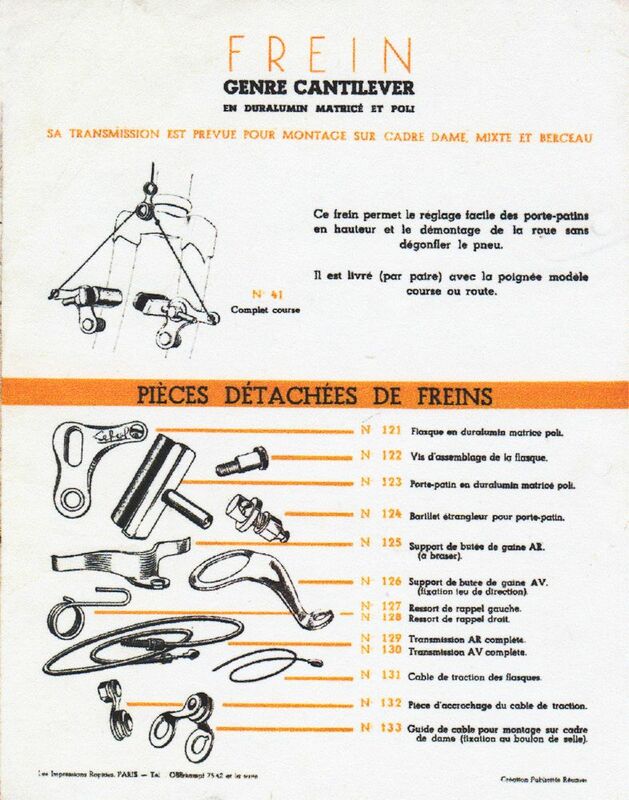 The business plan, if you can call it that, was to import some hard-to-find parts, make a few small items like bell mounts and decaleurs, and maybe to eventually to have a semi-production frame made. That was the extent of our plan. The name came from my orange bike, which was in our living room when we were trying to think up a name over a few glasses of wine. I'd had zero experience in the bike business, had never sourced anything overseas, and didn't even want to work full time. 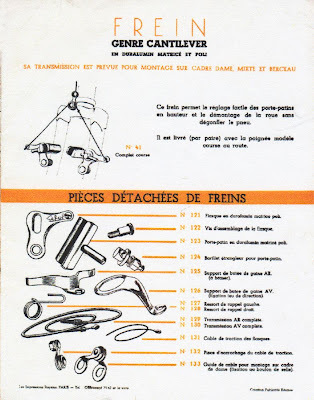 The only thing I was sure of was that there was a need for practical, well, made, attractive, and reasonably priced components for cyclists who wanted an alternative to the racing-style bikes and parts that, at the time, dominated most bike shops. 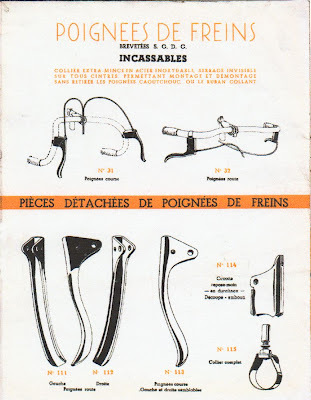 Many of our first items were new-old-stock (NOS). We bought most from an old acquaintance and parts distributor. 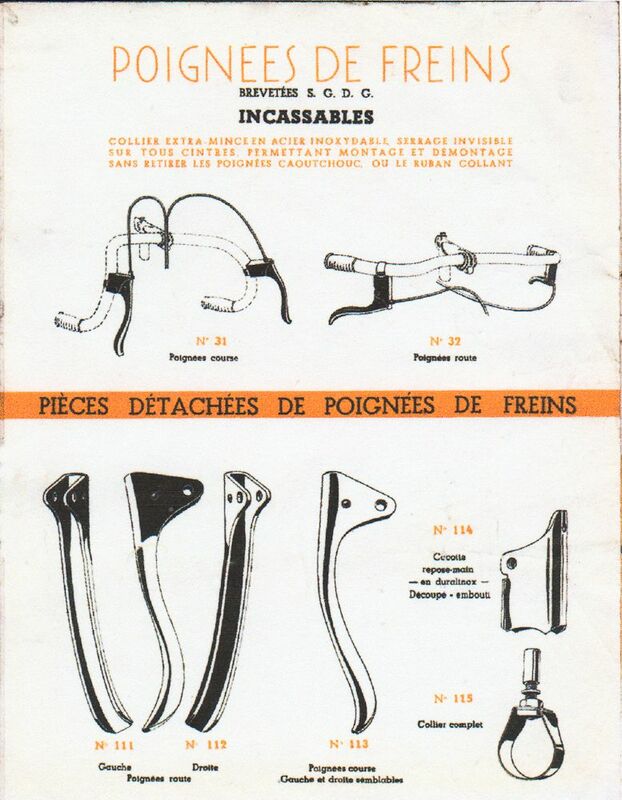 We soon started making contact with European distributors who had stocks of interesting NOS parts. Then came some new stuff from Japanese and European firms including MKS, Stronglight, and Ostrich. Next we started to having racks and decaleurs made by a local metal fabricator and then bags, flashlight mounts, and more leather goods. This was fun and the company was starting to grow rapidly. Reading the 685 posts on this blog will give you a pretty detailed history of what's happened since, but I'll write about some highlights in Part 2. We've been going over the inventory and identifying things that will be discontinued or that we are overstocked on. We're trying to make room for upcoming big shipments. So there's a bunch of new stuff on sale. Check out the Specials Page. Some of these items will only be on sale for a day or two, or until stock levels are back to normal. 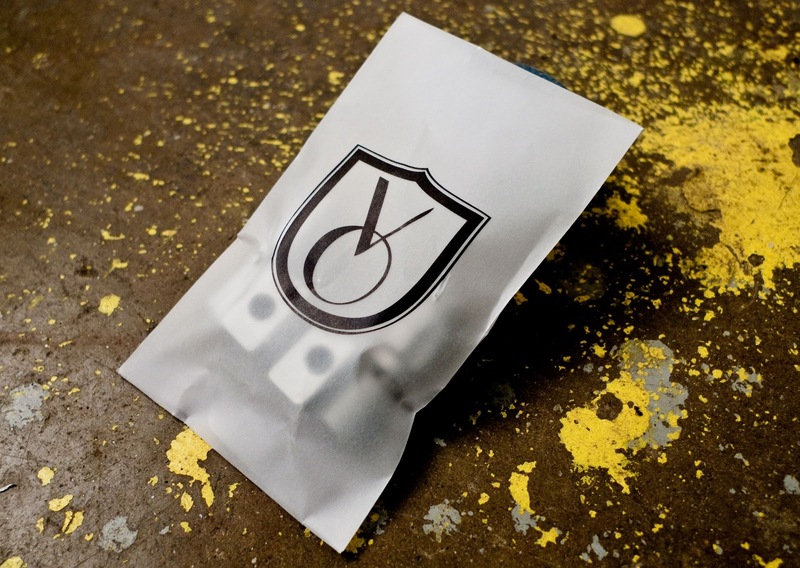 The long term plan for VO is to sell more VO and Grand Cru products and items that are unavailable elsewhere, and slowly cut back on the more common items made by other companies. 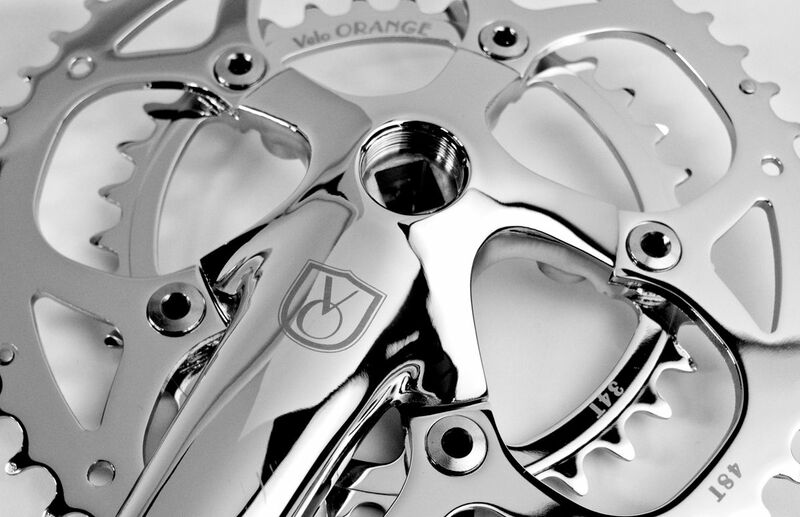 We're expecting hundreds of VO and Grand Cru cranks in a couple of weeks. 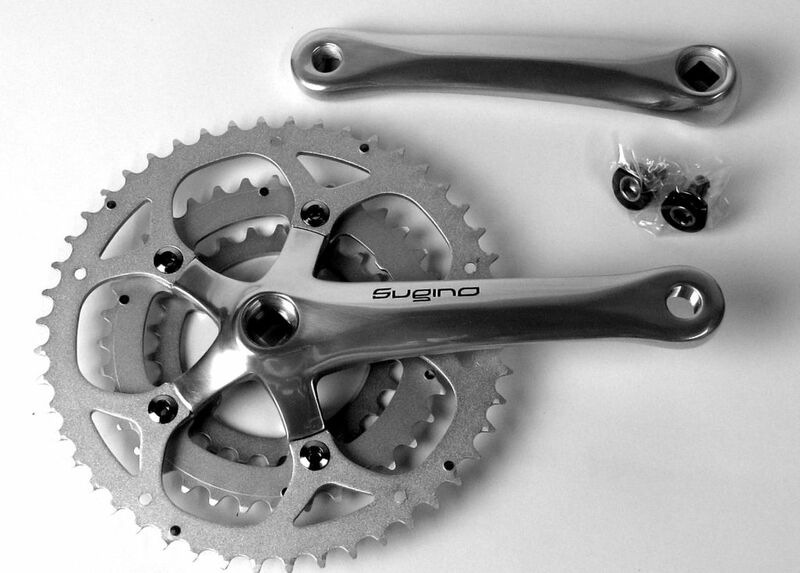 Meanwhile we have a huge inventory of Sugino cranks. This got us to thinking that it would be fun to try out some of the coupon features built into our new site software. So we've created a coupon code (sugsale) that gives you 30% off any Sugino crank that we have in stock. Simply enter "sugsale" under "Gift Certificates or Coupons" on the "My Cart" page. The coupon will only be effective for one day, tomorrow, October 27. If this works, we'll have other coupon sales from time to time. Just to be double extra clear: Click on "My Cart" (not "Checkout") on the top right of the screen to enter a coupon or a gift certificate. 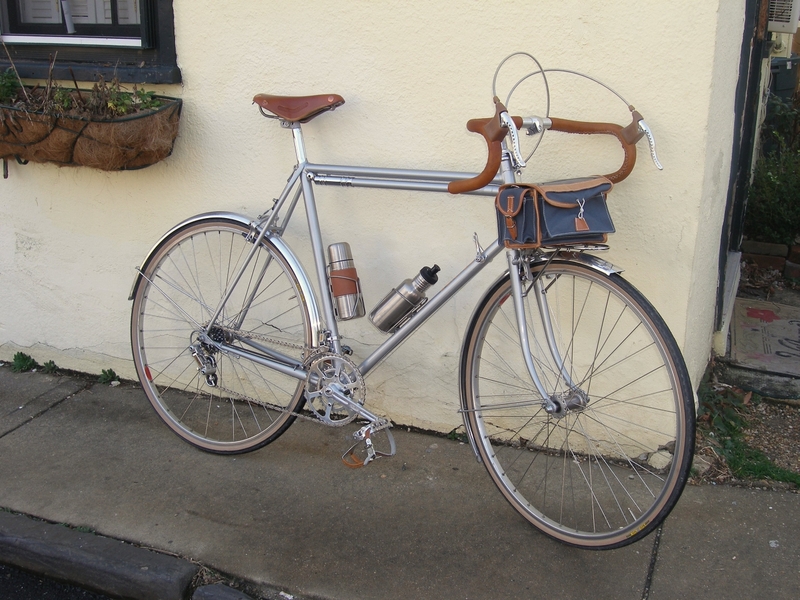 Here's a photo of my new polyvalent. I'm commuting on it every day. It's a great frame... the welding and paint are very well done and it rides like a dream! Anyway, thanks again for all the great VO products I own, they're top notch! And here's a cool rando/porteur built by Pierce. His description of it is the first comment to this post. 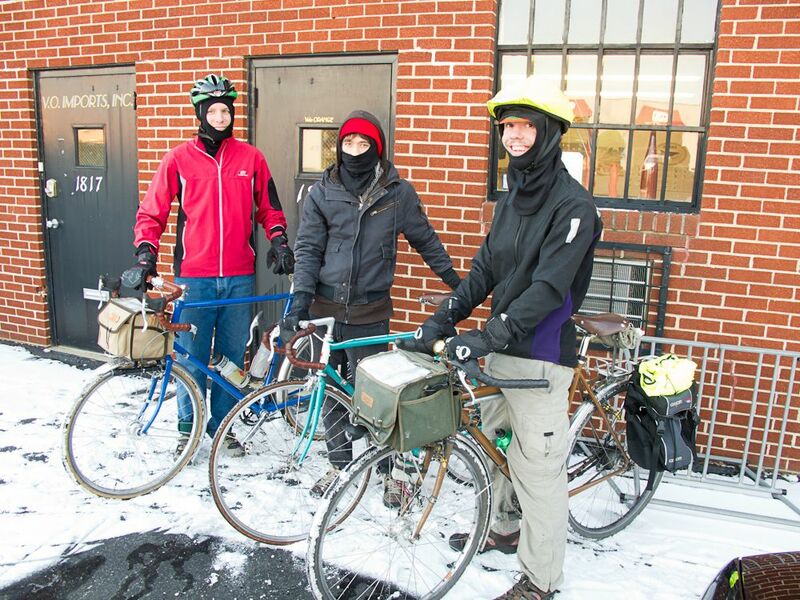 Speaking of nice bikes, the Philadelphia Bike Exposition is this weekend. VO isn't displaying, but there should be no shortage of other nice bikes. We'll have a disc brake version of the dyno hub. A lot of you asked for them. Prototype PBP double-eyelet rims are here and they look great. We hope to have them in stock by mid-winter. 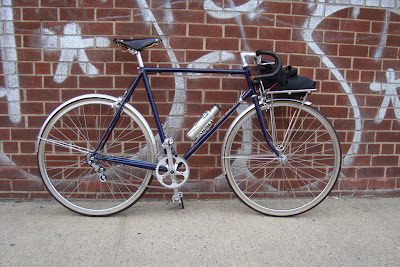 A 700c version of the Polyvalent is in development. We just received another shipment of Pari Moto tires. Longtime customer Bob R.attended the annual TOEI Owners Meeting in Japan. He was also the guest of honor. Photos can be found here. 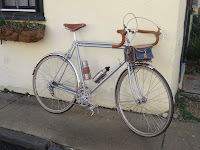 The photo is of Linda's VO Mixte, a very fine build. 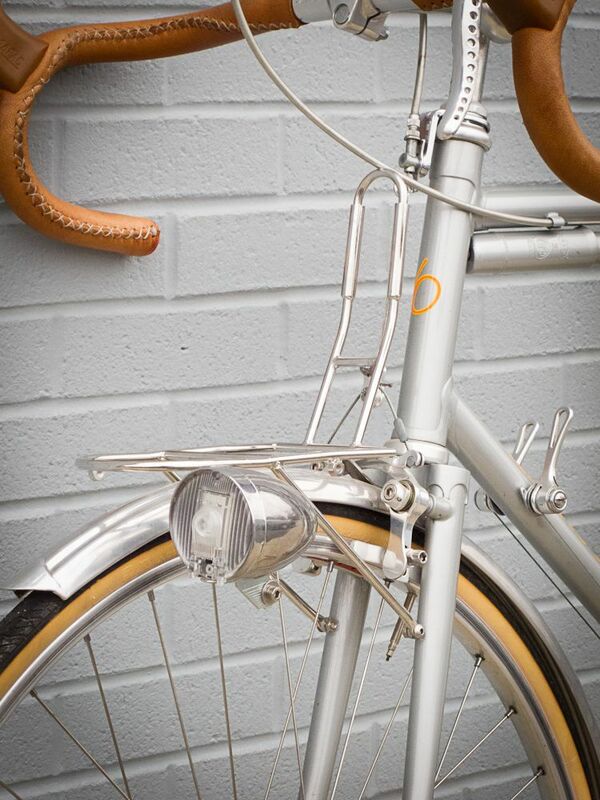 Hufnagel Cycles, of Portland OR, is creating some really cool custom rando-style bikes. Check out the first two, which feature a few VO parts. 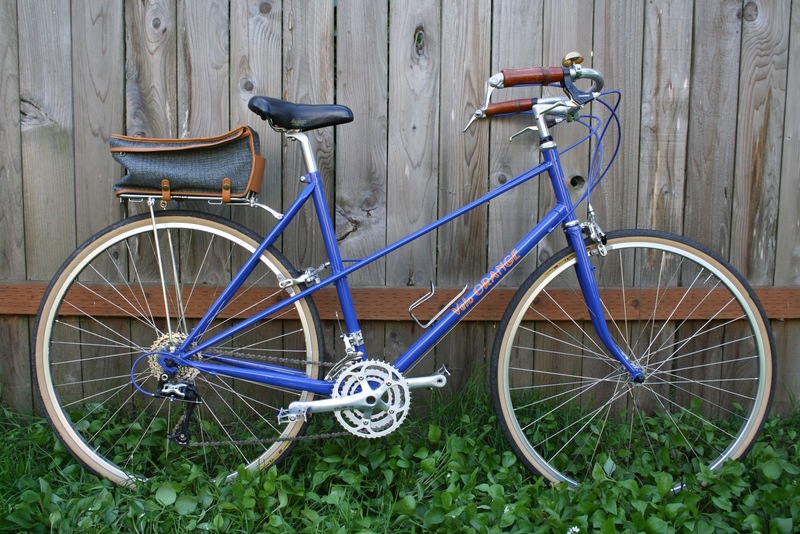 Kyle B. built a lovely mixte based on a 1984 Nishiki Sport Mixte frame. Lots of VO parts, of course. 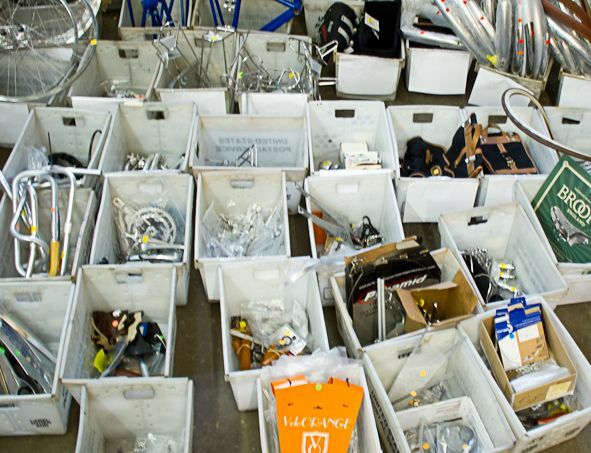 We're selling most of the sample parts that were displayed at Interbike or in our showroom; they lack packaging or show some shop wear, but are almost like new. Then there are some returns, a bunch of prototypes, a few scratched frames, some discontinued parts, and stuff that's been used on test bikes. All-in-all there are hundreds of items. We want to blow them all out in one day! So most will be priced at about half the regular web site price. 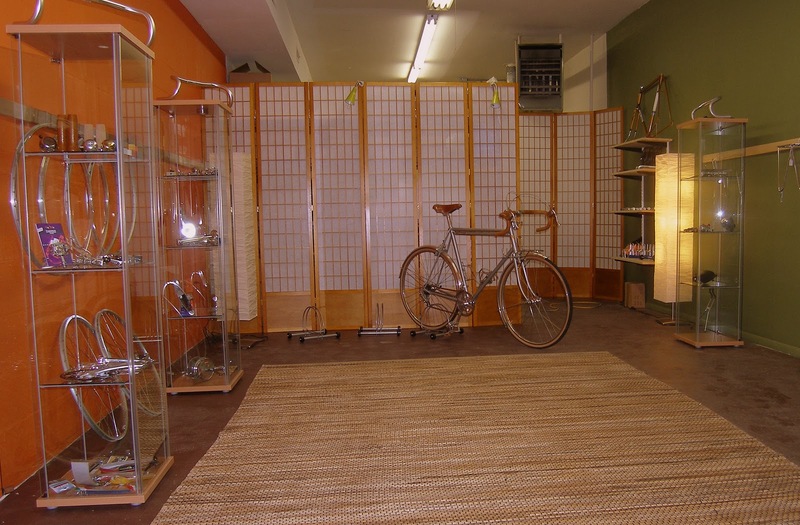 We'll also have frames, and bikes, and parts that our staff members want to sell from their personal stashes. In case you can't find any garage sale stuff you like, we'll offer 20% off on any parts, accessories, or frames (but not mini-build kits) in stock. You must be here to receive the 20% discount - this is not available through on-line sales. The VO Garage Sale will take place between 9am and 1pm on Saturday, November 6, rain or shine. the 20% discount is available to those who buy in person, not on-line. Items on sale and frame mini-build kits not included. BTW, the scans we made are of copies of the original that Mel Pinto gave me years ago. 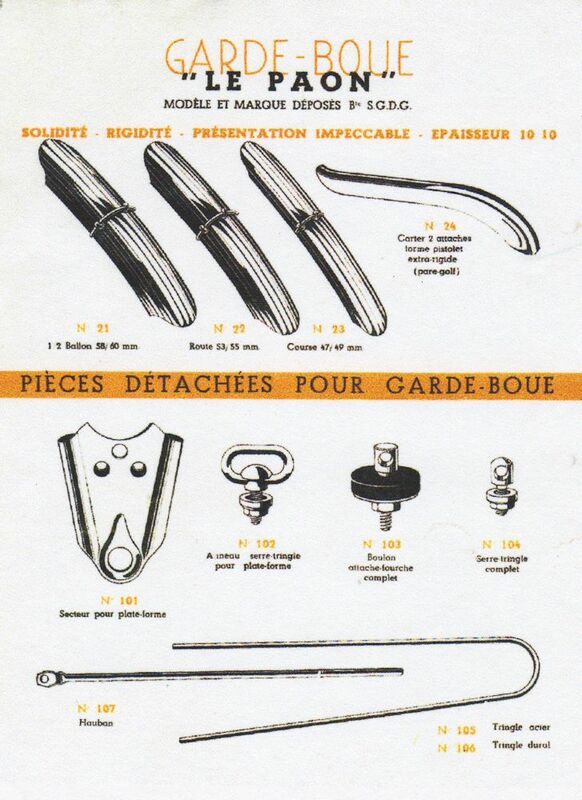 You'd be amazed at the copies of old French catalogs lying around my office. 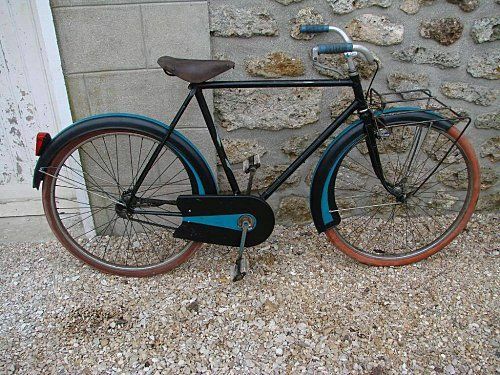 Many are from Mel, one of the great men of the French and American bike business! A lot of folks have e-mailed asking about the new dyno hubs I've mentioned. I'm also told there was some rather silly speculation about them in various discussion forums (Due to time constraints I no longer read any forums). In any case I thought I'd say a bit more about them. First off, I want to repeat that new hubs are not designed by VO. I only wish we were that smart and inventive. We found this new company, or they found us, almost by accident, but when I saw the hub mechanism I was stunned. I realized that they would cut resistance, compared to a normal dynamo hub, by 50% to 90% on most cyclists bikes. How is this possible without defying the very laws of physics? It works by uncoupling the dyno mechanism when the lights are not on. So the drag, during the day is that of a normal high-quality sealed bearing front hub. At night the drag is that of a nice (say Shimano) dyno hub. My informal survey of VO's dyno-using customers shows that most use their lights no more that 10-15% of total riding time, yet they have dynamo drag 100% of the time. That's why I can't imagine anyone buying a dyno hub without a clutch now, except for someone who has their lights on all the time. Game changing? It is for me! The hub looks like most other dynamo hubs, save for a circular on/off switch that activates a sort of internal clutch. They are now in production, but delivery has been pushed back to about the end of the year. The price should be around $120. Pre-built wheels will also be available. A new head light will also be available. It uses a Cree LED. Our lighting expert and tester says it's among the brightest light ever made, though the beam is a little narrower than the best European lights. The cost will be around $60. 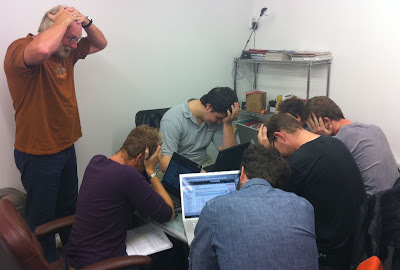 We get a lot of e-mail questions at VO, an awful lot! I thought I'd answer a few of the ones that have recently been asked several times. When will you have more sizes? We have a 40-foot container due in at the end of the month. All the VO and Grand Cru cranks will be on it, except for the 172.5 sizes. They are a couple of months out. Will you sell just the 50.4bcd arms, rings, bolts, single speed version, etc? 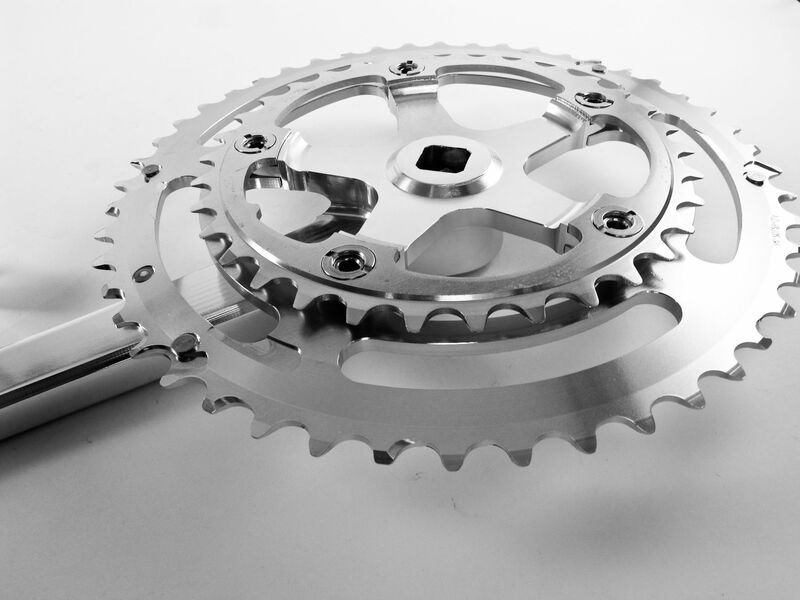 We'll have chainrings in various sizes in about 2-3 months. The bolts are already for sale. I have not yet decided if we'll sell the arms separately. 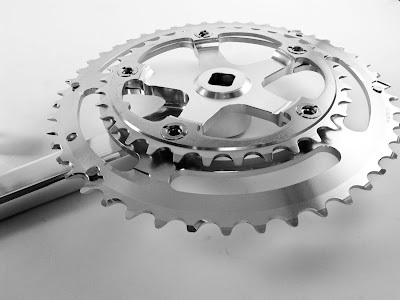 A single speed version with various single speed specific rings is on the way, maybe by late fall. Most sizes will be here in a few weeks, but the 48mm Rando bars are delayed a couple of months. Will two rolls of tape cover them? Of course, just like any other bar. When will the wider version of the PBP rims arrive? Soon, maybe two months. They will be called the Raid rim and be 22mm wide, but look like the PBP. Will they have double eyelets? We are working on a double eyelet version of the PBP rim first. Once that's done we'll see about the Raid rims. What's up with the hubs you wrote about? We've been testing them and all but the high flange cassette hub are going into production ASAP. We hope to have them in a few months. This has taken longer than expected, but when you see the quality and style of the final versions I think you'll be impressed. The wide flange cassette hub body is an all-new design so it's taking longer to get just right. The high-low cassette hub is done and in production. What about the "game changing" dyno hub? We've put many many miles of real world testing on the prototypes as has the factory. They are now in production and should be here this fall. We'll have a matching LED light that is brilliant (pun intended). I'm super impressed with this combination. The price is great, but the performance is ground breaking. I've wanted to offer VO bars for a couple of years, but it's surprisingly time consuming to design and test bars. There are so many subtleties to their shape. We looked at many popular modern and classic bars (I have quite a collection) and tried to identify the best features of each. Then I added my own preferences, mostly longer grip areas or ramps. The result is these two new Grand Cru bars. The first is a classic road bar that reminds me of the old Phillipe Professional bar. The second is based on my idea of the perfect Rando. 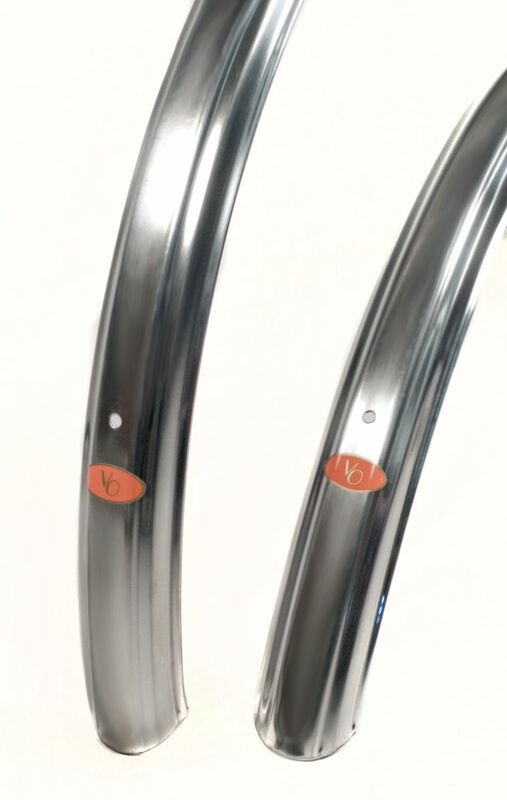 Both bars have a high polished center section. The area under tape is bead blasted. The Grand Cru crest appears on either side of the clamp area. The clamp area is bulged, not sleeved, to prevent "creaking". Our Classic round bend handlebar, the Course bar, has a long flat ramp aft of the hoods. This allows you to slide you hands forward or back which, at least for me, adds a lot of comfort. The drops are open and also extra long so, again, there is plenty of room to move your hands for and aft. The drops are parallel to the ramps on top, allowing them to be level. You'll see bars like this on many classic constructeur bikes. 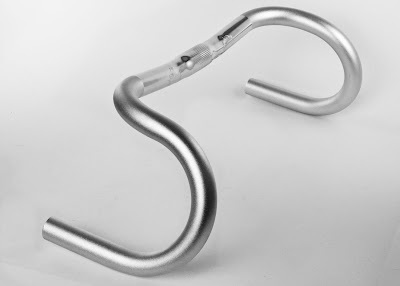 This is a great all around drop bar for long distance. Though it may not be important to everyone, I also think this is a great looking bar with smooth classic curves and a very nice finish. Our new Rando Bar is the bar that I always wanted. After riding with several different French, American, and Japanese rando bars, I designed this bar to my ideal. It has substantial flare for a wide stance in the drops. The bend is round and open, as on our Course bar. The area behind the hoods is long and flat for extra comfort. The drops are also long so you can slide you hands well back. 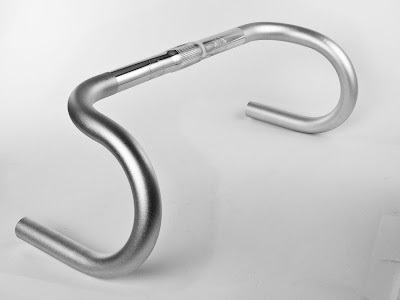 The Rando bar has a medium drop, 130mm. The reach (measured from the stem clamp forward) is about 115mm. Available in 42, 44, 46, and 48cm center-to-center at the ends; the width at the hoods is about 7cm narrower than at the ends. We have more Grand Cru 50.4bcd cranks in stock. Check out these nice photos of a VO Randonneuse in Japan. 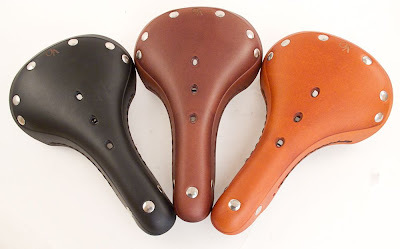 We have a new saddle. I'll write more about it soon. BTW, if you find a bug please tell us which operating system and browser (including version) you're using. We know that early versions of IE are not compatible. We know there have been a few issues so far. For some people, the "Under Construction" warning comes up instead of the home page. If you're getting this page, it means your computer has cached the old page and just needs an update. 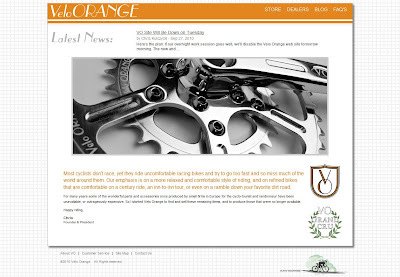 You can try to clear the cache on your browser, but if that doesn't work just point your browser to store.velo-orange.com and you should be able to see the new store no problem. We had problems accepting international orders, but we're working on it now. If you're still getting an authorization failure when you try to check out, send us an email and we'll figure it out with you. For those of you using Internet Explorer: if you're not already, please upgrade to the latest version IE 8! If you're running version 6 or 7 the site will not display properly; it still works, but the layout gets destroyed. The new site was designed to work best with Firefox/Chrome/Safari (standards compliance is important), so unless you have specific reasons or limitations that require the use of Internet Explorer I'd really urge you to use one of these browsers instead. We'll be finding many little bugs over the next few weeks, but we'll take all the help we can get with spotting them. Thanks for being patient while we work out these (and other) problems! As we wait for the new site to filter through the inter web tubes, I thought we'd post a few shots of the GC 110bcd double crank. We just received a small advanced shipment of these by air. The rest will arrive by ship in a few weeks. They come with 48/34t 7075 alloy rings; that means they'll last a long time. The 7075 rings really are a big deal; that's why TA rings are so expensive. The price is $190 and the q-factor is around 140mm. The 170mm and 175mm lengths are here. 165mm and 172.5mm lengths will arrive later. And, yes, the arms are cold forged. Weight is around 670g. The dust caps/bolts are self-extracting. Uses a 110mm BB. The two new Grand Cru drop bars have also arrived. We'll take photos soon. Then there is the new model VO saddle. It's shape and dimensions are close to that of the Team Pro. Photos and details coming soon. Here's the plan: If our overnight work session goes well, we'll disable the Velo Orange web site tomorrow morning. The new and improved VO and VOI sites should come on line later in the day. At least we hope they do! This blog will also be redesigned to match the new site. Wish us luck.